» Headphones or Speakers For Transcription? Headphones or Speakers For Transcription? I have been asked more times than I can could which method I prefer to use for listening to my audio files while transcribing. Do I like to plug in headphones or simply use the speakers that come built-in to my laptop. There are pros and cons to both methods of listening, but knowing the little trade secrets will help you decide which is better for you and your environment! 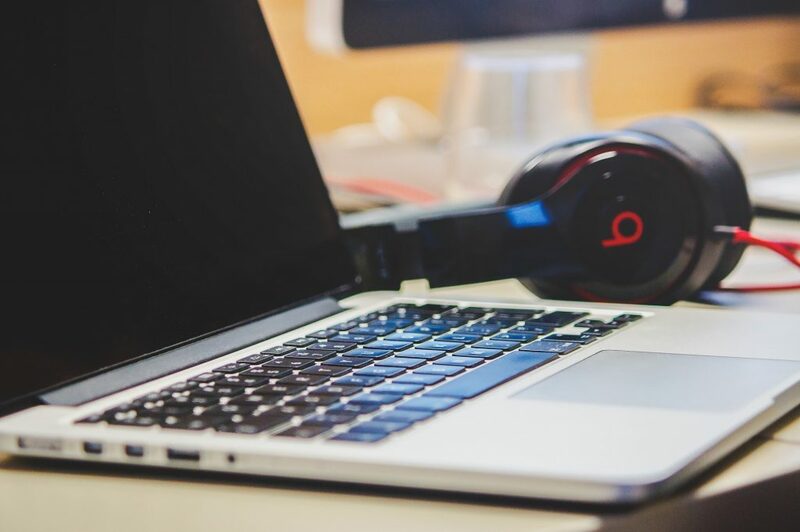 What I first started in my career as a transcriptionist I never used headphones at all. I liked to use the speakers because, for one thing, I didn’t have to go out and buy anything to start doing my job and making money. I couldn’t quite see the benefit of spending money before I had even made enough to buy a pair that were worth having. Because the nice ones, are pretty expensive. I used the speakers and I thought they worked just fine, I didn’t have any qualms over it whatsoever. Until, I ran into a snag and had to start going to the library to work instead of at home. I had to go out, take the plunge, and buy a pair of headphones. But me being as frugal as possible, I went and bought the cheapest pair I could find. They were Skullcandy earbuds. I didn’t order them off of their site, but here I added the link just in case you wanted to check out what they have to offer. They were cheap, on sale at BestBuy, and I believe they were only five bucks. I thought, well, they’re cheap, and they will have to work for the time being. The first time I used them inside of the library, I was completely astounded. The sound was so clear, I could actually hear the people’s voices clearly without having to try and cancel out the background noise. I was amazed, and a little ticked off at myself for not spending the couple bucks on them sooner. There is nothing more important (other than keeping in constant communication with your clients) than going out and getting yourself a pair of earbuds or headphones. Once I started using the earbuds for every job, I started to get through audio faster, and in turn, make more money. Which is exactly what we want, to make the most amount of money for the least amount of time, take control of capitalism and entrepreneurship. I loved the earbuds, and since that point a few years ago, I have not used the speakers since, and I could not be more happy about it. The earbuds were great, I was pleased with them, so then I went on to see if maybe headphones would be an even better choice. So I bought a pair, the kind the covers your entire ear, not just the earbuds that just slip into your ear canal. I figured, well, the earbuds were great, but maybe headphones will help with canceling out even more background noise from my house. Kids and dogs running around can get pretty loud sometimes, so anything to help cancel that out for a little bit while I worked. Low and behold, the headphones were even better than the earbuds. But still with these, I bought them on sale at Walmart, but I included a link to skullcandy again above for headphones. They cancel out noise from the transcribers personal environment. They help the audio sound more clear to you while transcribing. This is because the audio is coming directly to your ears instead of into the room while using speakers. They allow you to go into public places with Wi-Fi and do work, so you’re not stuck at home all of the time working. They help you to be less distracted while working. Personally, to be honest, when I was using strictly speakers, I would get so distracted quite frequently. I would have to fight to urge to turn the TV on, or watch a movie, and other things of that nature. Since I bought the earbuds and headphones, I got work done faster, worked more efficiently, and the audio came out so clear that I was excited to work everyday, knowing that I wouldn’t have to decipher what the speakers were saying. As I already stated, I used to strictly used just the built-in speakers on my laptop to transcribe, and I didn’t have a problem doing so. When I first started off, I liked using the speakers. Using them, to me in my mind, made me feel like I was being smart not spending loads of money of headphones or earbuds. I felt like if my kids and dogs heard that I was doing something on my computer, that they would realize that for the next 45 minutes, mommy was busy. And for a time, it did help. They heard that I was clearly doing something on my computer, obviously they didn’t understand that I was transcribing, but they knew that I was busy. When I first started, I never liked to sit and transcribe for longer than 45 minutes at a time. I liked to take a break, and pay attention to my kids and dogs, and it also gave me a chance to relax a little bit. Stretch out my fingers from typing, give my brain a little break, and also get a drink or snack. But I was never one to sit for hours on end doing any one single task anyway, so taking a break every so often just worked for me. I know some of my transcribing peers can sit for hour upon hour and transcribe like a machine, but that’s not me. And that doesn’t have to be you either! Speakers can be great for a person who just started out, if you don’t want to spend the money, that is completely fine and justifiable. I would highly suggest downloading audacity. Audacity is a program that helps to clear up audio files. You can also use it as an editor and recorder. The best part is that it is completely free. I very highly suggest using that program if you will be using your speakers, but you can definitely use the program with earbuds or headphones as well. The download helps you transcribe because you can slow down or speed up the audio file, but also unlike most playback programs, you can change the pitch of the audio. Meaning, that if one of the speakers has a very low pitched voice, you can raise it to be more audible. And the same is true of the reverse, if one of the speakers has a very high pitched voice, you can lower it to a more audible sound, making it easier to transcribe. Speakers can be great for a newbie, not wanting to spend a truck load of money of headphones. And on certain occasions, speakers can help to get rid of background noise, white noise, or a bustling restaurant or any other place of that nature. Personally, I would highly suggest to you, new or old transcriber, to get yourself a pair of headphones. Earbuds can work well for awhile, but if you live in an environment that is particularly busy or loud, I would suggest headphones over earbuds. Speakers are great for a person who lives alone, or has a room they can go to where it is quiet, and also if they don’t want to spend an arm and a leg. But in all honesty, once you have clients and are making some money, I would suggest getting yourself a pair of headphones. They don’t even have to be of the highest quality. You can spend 10 or 20 bucks on a pair from Walmart or BestBuy, and they will certainly do the trick. Finding what works best for you is the most important part of this adventure. Try using earbuds or headphones, try just using the speakers on your computer. Test out different playback programs, everything is subjective. I can give you suggestions on how to succeed until I’m blue in the face, but it is ultimately up to you to find what works best for your personal situation. Get a pair of five dollar earbuds from the store, try them out, see if you like them better than headphones or speakers. Do the same with headphones, get a pair and test them out. Not to mention, that a lot of public libraries offer headphones to patrons. Just go up to the front desk and ask if they have headphones you can borrow. So instead of dropping the 10 bucks to buy your own pair, test them out at a library to see if they’re even worth the time to you. I personally like the accessibility and movability of using earbuds and headphones. I can take my kids to the library to read, find books, or participate in the activities they offer, while I sit there quietly with my earbuds plugged in, and no one’s the wiser. But like I said, finding what works best for you in the hardest part. Test out the different ways to listen to your audio files, and see which is the most comfortable for you!